We've got more good news for Google Apps users. Today we're pleased to announce that we're extending the 99.9 percent service level agreements we offer Premier Edition customers on Gmail to Google Calendar, Google Docs, Google Sites and Google Talk. Check out the Google Blog to read more about the announcement and how the reliability of Gmail compares to on-premises alternatives. There is a widely held belief that technology progress in the enterprise is slow and methodical, that adoption cycles are long, and that experimentation is inappropriate. Here at Google we believe that experimentation is a good thing - even in the enterprise space. Some of our best ideas have emerged from experiments, products like Google Maps and snazzy new Gmail Labs features like Calendar and Docs gadgets, as well as Google Suggest and the collection of enterprise search labs. Today we're extending that innovation and announcing Labs for Google Apps, a set of experimental features available free to businesses and schools using Google Apps. The first set, available now, are derived from tools Google uses internally and can be installed easily from the Google Solutions Marketplace by Google Apps domain administrators. Once installed (see walkthrough), users on your domain will be able to log in and access these features alongside existing applications like Gmail and Sites, and your domain administrators can configure them using the standard Google Apps control panel. These new Google Labs tools are built on Google App Engine, the same scalable, efficient, and reliable infrastructure publicly available to developers. Read more about Labs features and App Engine. We're also planning on opening up the Labs for Google Apps platform to third party developers, so that new and existing vendors can build apps for the million-plus businesses using Google Apps today. Going forward, we'll also be adding more of our own Labs applications for your teams to experiment with and benefit from. Check out the new features and let us know what you think! 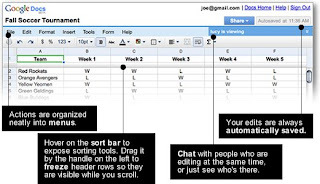 When you next open a spreadsheet in Google Docs, you'll notice a number of updates to the spreadsheets interface. The simplified toolbar makes it easier to find the most commonly used formatting tools, and spreadsheet features can be found in the new menu, which resembles the interface you're already familiar with in documents and presentations. Use the blue 'Share' menu to publish your spreadsheets to the web, give users viewing rights, or add collaborators who can edit your spreadsheets with you. And as you create formulas and format your data, you'll also notice that we've made speed improvements so your spreadsheet changes load faster. All the features you love about Google Docs spreadsheets are still here -- just better organized to tidy the interface and let us easily add new functionality. A strategy for lean times: Adopt a hosted messaging and collaboration solution with Google Apps. If you’re thinking about upgrading your messaging and collaboration tools, come listen to Michael Osterman of Osterman Research on Thursday, October 9, 10AM PDT. He will talk about factors to consider in moving to hosted solutions and how to best prepare for a smooth transition. Register here at Google Apps Online Seminars. Investigate the Security of Google Apps. Learn the steps that Google's taking to keep your Google Apps data safe on Thursday, October 23, 10AM PDT. Hear from Google Apps security expert, Eran Feigenbaum, on new updates to Google's processes and technology that make our web applications even more secure. Register here at Google Apps Online Seminars. We hope you will join us for these live seminars. But, if you can't make it, you can always listen to them later on at our Google Apps channel on Youtube. We also keep our Google Calendar Gadget update-to-date with informative webinars and other events. As always, let us know if there are specific topics you'd like to see us cover. Thanks again for your interest!